Hampton by Hilton invited me once again to join its Ultimate Seekender Team this year. To kick things off we headed to the Wynwood Art District in Miami. The Wynwood Art District is a great place for art-loving Seekenders of any age. Feeling like the oldest people in the world, escapees from the leafy suburbs of New York, we awkwardly met “Ryan the Wheelbarrow” and his compatriot Pedro Amos (AKA Amos) on an urban street corner during our recent trip to downtown Miami. 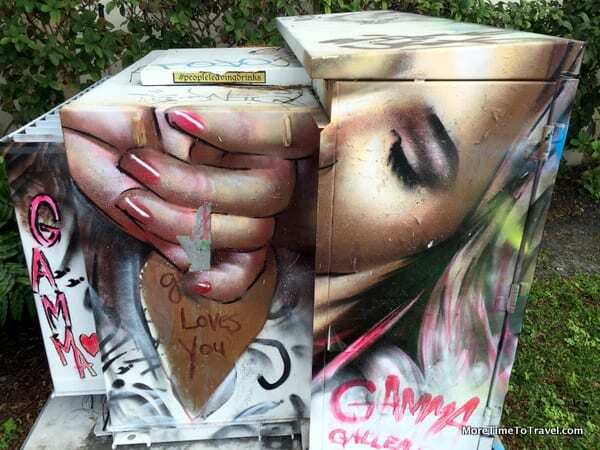 As two art-loving Seekenders, we joined a small group of tourists assembled for an insider’s walking tour of the Wynwood Art District that was offered by two young, talented spray paint artists who were surely less than half our age. During the course of our travels, we’ve always loved finding and photographing graffiti and street art in cities around the world. But never had we been exposed to such a concentration of hundreds of spray paintings in one area nor had we had the opportunity to meet the local artists. Wynwood has been called the largest museum in the world. Here in this working class neighborhood in Miami, colorful, larger-than-life murals cover blocks and blocks of buildings and warehouse walls in the Wynwood Art District. The area was once known as “Little San Juan,” apropos of the large influx of Puerto Ricans who settled here in the 1950s. Now, it has been renamed not only because of the abundance of street art but also because of the scores of galleries and arty one-of-a-kind cafes, bars and boutiques that have sprung up alongside them—revitalizing a depressed neighborhood in the process. Ryan explained that street art is often commissioned by retail businesses. Other times, artists ask property owners for permission to cover a wall; and sometimes it’s done without asking. Some murals remain for long periods of time; others are soon covered over by other artists. Some spray paintings are signed; others aren’t. Because cans of spray paint aren’t cheap, the cost of creating a large mural can exceed a thousand dollars. The works of spray paint artists from 30 different countries are represented in this neighborhood. The Internet has made it possible to memorialize older murals that have disappeared. Some of the paintings themselves are memorials to street artists who have passed away. One of the highlights of the tour was our visit to the Wynwood Walls a curated collection of street art developed by Tony Goldman, who was the visionary leader of Goldman Properties until his death in 2012. Launched in conjunction with Art Basel, the walls of this “outdoor museum” showcase various street artists. A champion of historic preservation in urban communities and “legal” graffiti, Goldman achieved the goal of transforming Wynwood into a “hipster” center for arts and entertainment. The sprawling Wynwood Art District stretches between 20 and 36th Streets—and between North Miami Avenue and I-95. There is no admission charge for visiting Wynwood Walls. On the second Saturday of each month, visitors can join a free Art Walk. Ryan the Wheelbarrow and Pedro Amos offer private walking and bicycle tours for individuals or groups. To find out information, see their website: Miami’s Best Graffiti Guide. If you are a clothes lover, be sure to visit the adjacent Miami Fashion District. Disclosure: I am a member of the Hampton by Hilton Ultimate Seekender team (the only empty nester Seekender) but all opinions expressed in this post are our own. Less than 15 minutes from the Wynwood Art District, the priced-right Hampton by Hilton Brickell/Downtown is a perfect place to stay. The hotel has a contemporary urban design, spacious rooms and its own art collection. As of today, the hotel was rated #1 on TripAdvisor of 123 hotels in Miami. The helpful staff can provide directions to the Wynwood Art District by car or via public transportation. I just love street art. This post is going on my US Pinterest board for next time we are in Florida. It is kind of sweet that the street art tour was offered by guys less than half your age. They were so great! So energetic and enthusiastic, too! Wow, very cool! You always find such unique places, Irene. Thanks for sharing. These murals are so cool. I love the one with the three sets of eyes. I will be in Miami in a little over a month. Maybe I’ll have enough time to squeeze in a visit to the Wynwood Art District. Definitely worth a peek! Seeing all the beautiful murals in such large numbers is quite an amazing experience. Your colorful photos Wynwood Art District really help make the area feel alive with the Miami vibe and the warmth of the Florida sun! Thanks for a great posting! Yes, Wynwood is so alive and full of life! We’ve been in and out of Miami several times in the last few years but have only seen a few of its memorable sights. I love street art so the Wynwood Art District would be really fun to walk through. I’ll definitely have to schedule a longer layover! Next time I’m in Miami I’m heading to the Wynwood Art District. Very cool and colorful art! Looks like you enjoyed a fun “insiders” walking tour :-). Seekenders! I love it. What a wonderfully colorful exploration of the beautiful street art in Miami. Have to put this on the must-see list. I’m always a fan of street art but I’ve never seen a whole neighborhood where it takes center stage. I was so surprised to read how expensive it might be to spray paint a wall…thousands of dollars! But, the work that is produced is amazing. I’m sure more cities areas like the Wynwood Art District and it would be interesting to take a tour. We live in Florida and had no idea this was here! Wow! Such amazing talent – and I had no idea that a mural would be so expensive just for the paint…but you’re right, spray paint cans aren’t cheap. I love the energy behind this movement. Thanks for letting us know about this area – we’ll definitely have to plan a weekend visit soon! I almost fell over when, too, when I learned about the costs! SO GLAD I SAW THIS JUST NOW!!! I am headed to Miami for only a few hours tomorrow, and have heard so many great things about Wynwood. Although I actually grew up there, Wynwood was built way after I left. I can’t wait to check it out!!! Be sure you have a camera in hand!